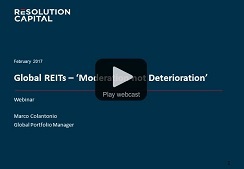 During this 30 minute webinar, Jan de Vos (Global Portfolio Manager) provides a performance update for the June quarter and discusses REIT’s arbitraging the direct market, the retail sector remaining under fire and more. 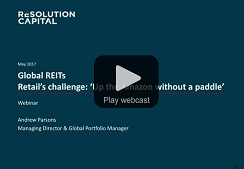 During this 30 minute webinar, Andrew Parsons (MD/Global Portfolio Manager), discusses the impact of the ‘Amazon effect’ on shopping malls and the retail sector; and the lessons learnt from the US mall sector. 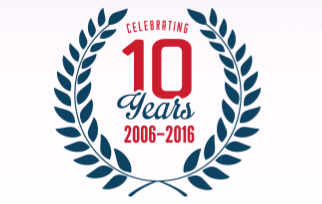 Resolution Capital achieved a significant milestone in December 2016, with the 10 year anniversary of the launch of its global investment strategy. 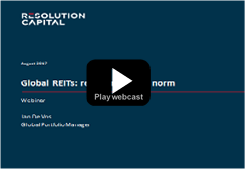 During this 30 minute webinar, Marco Colantonio (Global Portfolio Manager), discusses how Global REITs are positioned as interest rates and construction supply return to higher levels. During this 30 minute webinar, Andrew Parsons (MD), discusses current market conditions and the outlook for global listed property amidst the growing unease about the efficacy of QE policies. 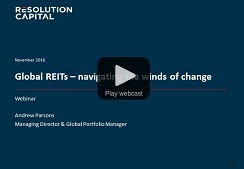 Global REIT Fund Manager of the Year, Again! Resolution Capital has been named the Global REIT Fund Manager of the Year in the 2016 Professional Planner | Zenith Fund Awards for the third year in a row. ESG is becoming an increasingly important investment consideration for investors. 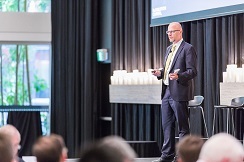 At the forefront of the worlds best ESG practices in the real estate sector, our panellists share their insights. Morningstar's Ross Macmillan examines a number of outstanding qualities that sets Resolution Capital apart from other managers. “Resolution Capital is delighted to have the qualities of the Fund recognised by Morningstar." 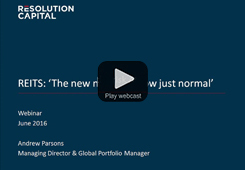 - Managing Director and Global Portfolio Manager, Andrew Parsons. Resolution Capital has been appointed as portfolio investment manager for the Global Property Fund, a new fund within Nedgroup Investments range of international Best of Breed™ funds. Brexit insights from Andrew Parsons, Managing Director. During our 30 minute webinar, Andrew Parsons (MD/Global Portfolio Manager), will discuss how listed real estate has ‎positioned itself in this new normal environment of low interest rates, low inflation, low growth and a multitude of geo-political challenges.